The NuTeV experiment at Fermilab has precisely measured how neutrinos interact and has found a surprising discrepancy. Their measurements indicate that one of the weak forces acts on neutrinos with a strength 1% less than it exerts on other particles. One percent may not seem a big difference, but the NuTeV measurement is so precise that the probability that it is consistent with the expected result is only about 1 in 400. The NuTeV measurement may have illuminated a flaw in a theoretical picture that has successfully explained the workings of the Universe for the last thirty years. 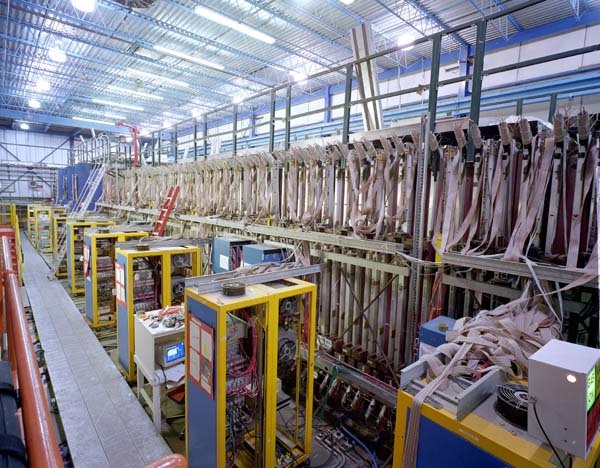 Future experiments at the Fermilab Tevatron accelerator in the US and the LHC accelerator in Europe could point to the source of the flaw. The neutrino is one of the categories of the fundamental particles that make up our universe. 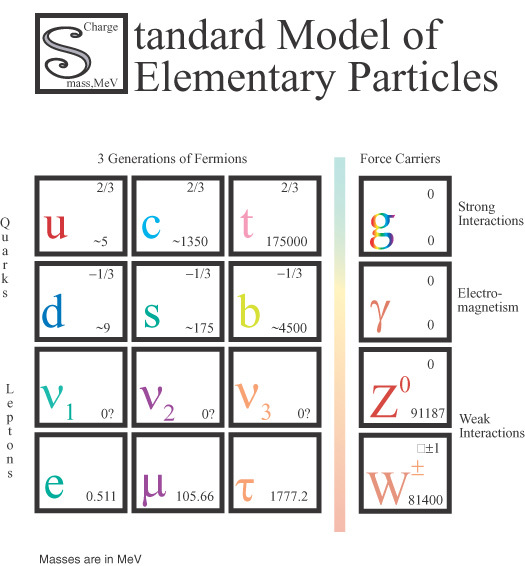 The particle family tree can be broken into three basic branches: force-carrying bosons, quarks and leptons. Each basic force of nature is associated with a boson. The photon which carries electromagnetic forces, the gluon that is responsible for strong nuclear forces and the W and Z bosons that are the intermediaries of weak nuclear forces have all been observed at particle accelerators. (Physicists believe there is also a carrier for gravity, the graviton, but have never observed this particle.) The quarks come in six varieties: up (u), down (d), strange (s), charm (c), top (t), and bottom (b). Leptons include both charged particles, electrons, muons, and taus, as well as three neutrinos, which are electrically neutral. Because neutrinos carry no charge, they are only affected by the weak force. As a result, they rarely interact with each other or anything else, so "seeing" neutrinos isn't all that easy. For scientists, understanding the uncertainties present in any measurement is one of the most important and difficult tasks in performing an experiment. A measurement of a 1% deviation with a 2% uncertainty doesn't tell us much since there it is very likely that random chance produced this deviation. However, a 1% deviation with a 0.4% uncertainty is unlikely to have just occurred by chance without some underlying cause. Like gamblers, scientists attempt to quantify the probability of a random unlikely occurance. For example, Las Vegas bookies working in June 2001 might have quoted a probability of 1 in 400 that the Washington Wizards basketball team would play in the NBA finals. In other words, if 400 identical basketball seasons, with all the uncertainties in injuries, team performance, etc., were played out, the bookies expect that, on average, the Wizards would be in the finals only once. This example raises an important point. Michael Jordan has now returned to play with the Wizards, a factor which might influence the Wizards' chances and which was unknown to anyone in June 2001. This is an uncertainty in the underlying assumptions of the measurement that scientists refer to as a ``systematic uncertainty''. These uncertainties are often the hardest to estimate, and much of the recent effort of NuTeV experimenters went into the understanding of these systematic effects. The NuTeV quoted probability of 1 in 400 for consistency with expectations includes their best understanding of these effects. The neutrino may seem like an esoteric particle, but in fact it shares the familiar spaces around us. The sun could not shine without emitting neutrinos, and these neutrinos shine on us just like sunlight -- about 1000 trillion pass through your body every second. Neutrinos were also produced in the Big Bang. One million of them in every gallon of space remain today as a souvenir of the birth of the Universe. Their pervasive presence in the world around us means that even very subtle properties of these neutrinos, like a tiny mass, can have a profound impact on the past and future history of our world. Physicists designed NuTeV so they could observe millions of interactions of the highest energy, highest intensity neutrinos ever produced. Fermilab , the world's highest energy accelerator, generated this beam from just five micrograms of protons. These were special protons, each given the entire energy of motion of a fruit fly in flight, concentrated into a single sub-atomic particle. This proton beam had a power of 100 million Watts. Slamming this immense power in protons into a target produces tens of billions of neutrinos every minute, along with a plethora of other high energy by-products. To protect the NuTeV detector from this onslaught of particle energy, experimenters shielded it with a half kilometer of lead, steel and dirt. Only the weakly interacting neutrinos could travel through such a shield. Observing millions of these neutrinos not only required a lot of neutrinos, but also a lot of detector. The detector itself was a a 700-ton sandwich with over a hundred slices of alternating steel and particle detectors. 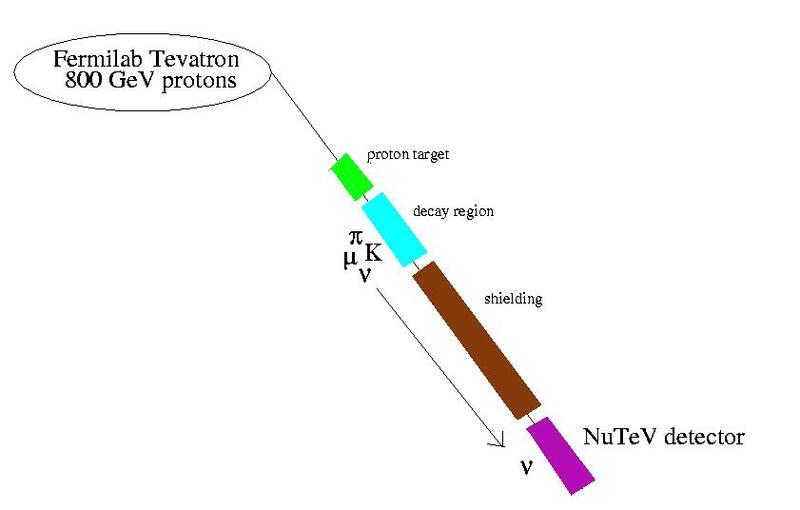 Even with 700 tons of target material to hit, only one in a billion neutrinos in the NuTeV beam interacted as it went from the first to the last slice. The NuTeV detector can see neutrinos because, on their way through the sandwich, they slam into a nucleus and break it apart. After the collision, the neutrino may stay a neutrino or turn into a muon. A muon is a heavy cousin to the electron. The surface of the earth is constantly bathed in muons that rain down from cosmic rays. (While you read that last sentence, a few probably passed through you!). Experimenters can easily observe muons, but hardly ever see neutrinos. A neutrino collides with a nucleus and stays a neutrino. A neutrino collides with a nucleus and turns into a muon. When NuTeV experimenters see a nucleus break up, they know a neutrino has interacted. If they see a particle leaving the scene, it's a muon. If they see nothing leaving, they know that a neutrino has come and gone. 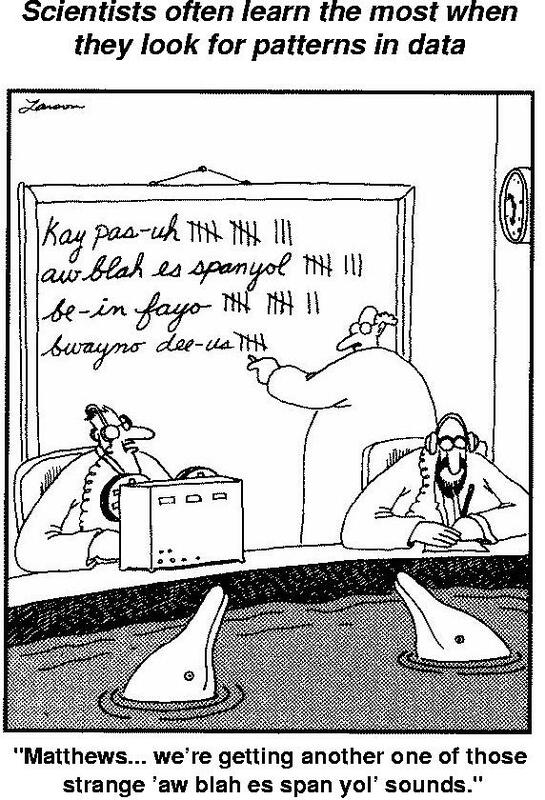 Experimenters count the number of times that the neutrino stays a neutrino and the number of times it changes into a muon. The ratio of these numbers is very accurately predicted from our theories of the Universe, which have been verified to a part per thousand accuracy in the interactions of particles other than neutrinos. Surprise! The number of times that a neutrino stayed a neutrino was not as high as expected. It's very close though; only about 1% of the interactions were missing. Experimenters at the Large Electron-Positron (LEP) collider at CERN recently measured this same interaction in a different particle reaction with a similar precision. They observed the same discrepancy, however, with less certainty. The consistency between these two very different measurements is striking. What does it all mean? Neutrinos have surprised particle physicists before. Recent experiments in the United States, Russia, Japan and Canada have found that neutrinos possess other unpredicted properties, such as a mass and the ability to oscillate: that is, to transform themselves from one type of neutrino into another. To explain the discrepancy between their very precise findings and their expectations, NuTeV experimenters wonder if their neutrinos have felt a new force previously unobserved in nature, or if there is some hitherto undiscovered particle influencing neutrino interactions. Physicists in the United States, Japan and Europe are planning a next generation of neutrino experiments which may solve the puzzles we've discussed here, or they may find even more puzzles! Other physicists, working at Fermilab or at CERN accelerators, may soon be directly producing and observing completely new particles that may be the very things that are influencing the neutrino now. It's an exciting time to be a neutrino, but an even more exciting time to be a neutrino physicist!